UK companies are due thousands in tax credits – can you claim? Prospects for innovation at UK Plc are strong, with uptake of the government’s research and development (R&D) tax credit scheme set to double in the next three years, according to fresh research. A new report reveals that while just 20% of companies have so far benefited from the incentive, 40% plan to use the scheme in the next three years. However, a lack of awareness and understanding about the scheme could be preventing even more companies from claiming, the study warns. Is the UK an innovation nation? And is every organisation playing its part? The generation and development of new ideas, products, technologies and services is critical to the success of any company, and to the UK economy. Yet companies of all sizes could be missing out on significant growth opportunities by not giving enough priority to innovation or ignoring the thousands of pounds in tax credits available for research and development. To help us gain a clearer view of the state of UK innovation, Management Today and R&D tax consultancy ForrestBrown canvassed the views of almost 250 leaders of small, medium and large businesses across a broad spectrum of industry sectors, from technology and professional services to media and financial services. 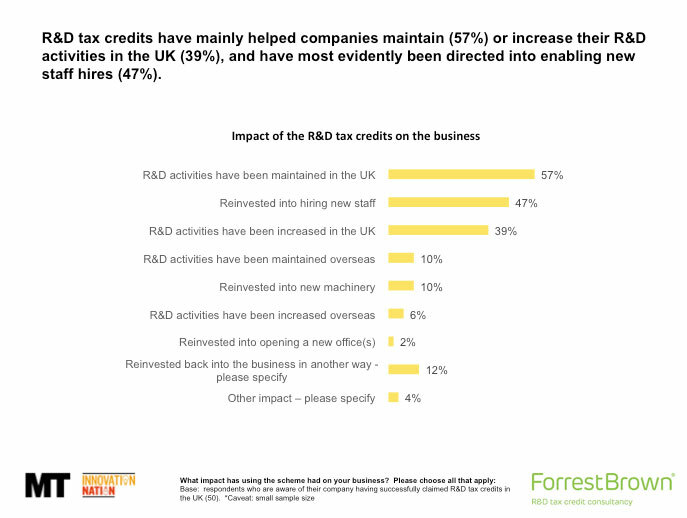 Publication of our wide-ranging survey – the first in nearly ten years to examine the specific impact R&D tax credits have had on UK Plc – coincides with the release of HM Revenue and Customs’ R&D tax credits statistics, which is likely to show another increase. However, our report reveals what influences the decision-making behind those statistics. For three quarters of the business leaders surveyed, innovation is of high priority or essential to their business (74%), with that figure rising to 91% among technology companies. 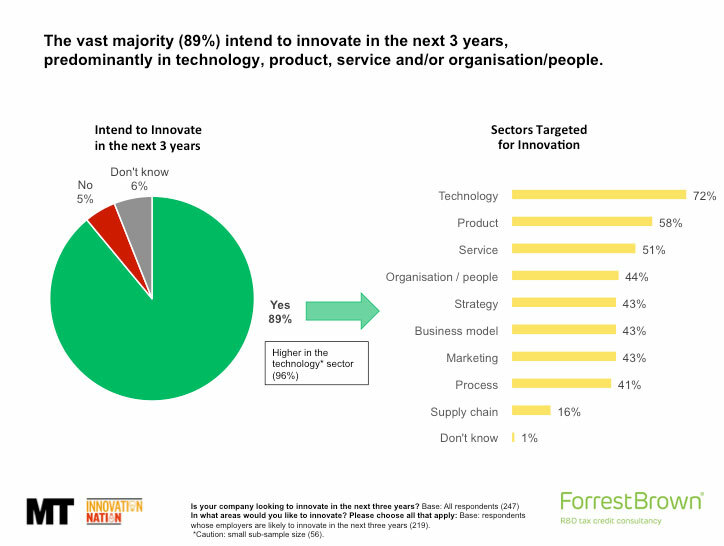 The vast majority of respondents (89%) say they intend to innovate in the next three years, predominantly in the areas of technology, product, service and organisation/people. 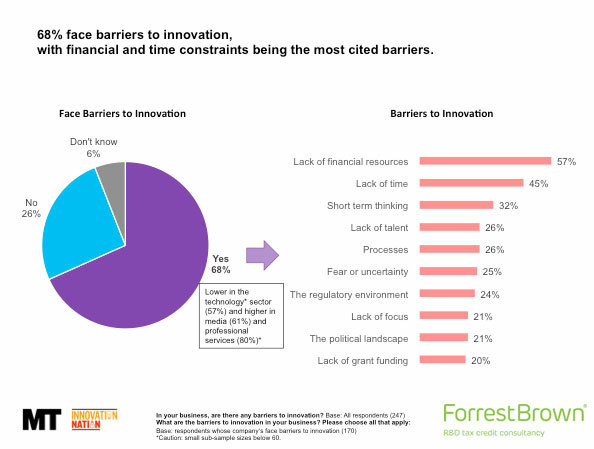 However, more than two thirds (68%) cite barriers to innovation, with financial and time constraints being the most common areas of concern. Some 57% of respondents say lack of financial resources is the main obstacle. Uncertainty surrounding Brexit is considered a further barrier to innovation for a quarter of the business leaders questioned. However, 11% say they are likely to invest even more in innovation as a result of Brexit, while 57% envisage no change in activity. Companies taking advantage of R&D tax incentives say the benefit they receive – either in the form of a cash payment or corporation tax reduction – is fundamental to their overall financial position. 80% describe the incentive as ‘important’, 40% say it is ‘very important’. Since their introduction in 2000, R&D tax incentives have been available to offset some of the cost of innovation and fuel further development and growth. Available only to SMEs at first, tax incentives for large companies were then rolled out in 2002. The average annual claim for an SME claimant, across the UK, is currently more than £46,000. For larger companies, the net cash benefit to a large company can be up to 8.8% of their qualifying R&D expenditure. 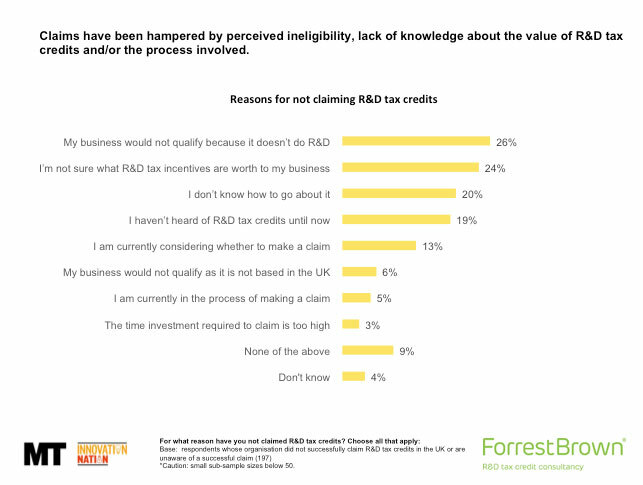 When questioned about the specific impact of the R&D tax credits, our respondents explained that it allowed their companies to sustain or, in many cases, advance their innovation efforts. Some 57% say they have maintained R&D activity as a result, while 39% have increased it. Almost half (47%) have been able to hire new staff as a consequence, and 6% have increased overseas R&D activity. Crucially, 44% say the amount of money they received through the tax credit scheme was higher than they had anticipated. Despite the government scheme’s growth, and positive impact on business, our survey results indicate that it remains an untapped resource. Almost 20% of the business leaders we questioned said they had not heard of the scheme, suggesting a need for greater education and awareness-building. And despite a range of R&D activities being eligible for relief under the scheme’s rules, businesses seem unclear on what qualifies. A common misunderstanding is that R&D claims can apply only to scientific sectors, such as pharmaceutical or engineering firms. However, the scheme is designed to assist all sectors and applies equally to products, processes and services alike. It applies not only to new inventions, but also to adaptations and improvements to existing products, processes and services. Yet in our survey, more than half of respondents were not aware that changes or modifications to an existing product counted, and more than 80% overlooked projects undertaken on a client’s behalf. More than three quarters (77%) of respondents did not know they could include unsuccessful R&D in their claim. Estimates for the number of companies thought to miss out on R&D tax credit vary widely, but some studies estimate it could be as few as 10% of eligible companies that benefit. Many of the businesses that do claim tend to err on the side of caution and submit conservative claims due to misconceptions of what costs can be recouped. The research suggests that while the government’s tax credit scheme is growing in awareness, opportunities exist to make it more attractive. Actions to promote the scheme, demystify eligibility and simplify the submission process could help government incentivise more companies to innovate – and in a post-Brexit world, convince more businesses to remain in the UK, or attract other high-innovation companies to these shores. The survey also suggests a need for companies to seek more specialist advice. A common hurdle for businesses lies in the fact that it is chiefly finance staff who deal with tax compliance, yet it is technical staff who are needed to appraise the R&D activities. The potential tax relief for R&D often slips between these two sets of stakeholders and therefore does not attract the combined consideration and focus required to maximise the opportunity. Simon Brown, managing director of ForrestBrown, said: ‘These findings verify the overall picture for R&D tax credits that we see first-hand. The overwhelming majority of businesses we work with view the R&D tax credits as a crucial source of funding that allows them to go on innovating, hire new talent and explore new markets. 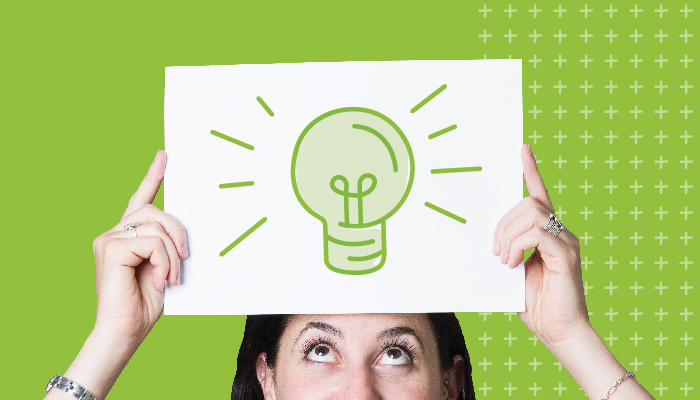 R&D tax credits help them to grow their business and in turn boost the sector they operate in. Hardware Group, which has an international presence, including offices in the UK and USA, provides advanced IT solutions and services. Stewart Holness, Hardware Group’s executive chairman, says: 'Historically the perception was that the R&D tax credit scheme was engineered to suit the more ground-breaking patent pending work, but it is much more encompassing than that today. The technology sector is more familiar with the concept, but most are just not aware of how R&D tax credits work.